It all started in Alexander City, Alabama USA, in May 1902, with 10 sewing machines, 8 knitting machines, and a 26 year old man named Benjamin Russell. Knowing the comfort and durability of cotton, he suggested to his father that an all cotton version of the original woollen football jersey be produced in order to avoid the chaffing and discomfort caused by sweating in wool. This change in fabric content resulted in the inception of the "sweatshirt" as we know it today - the hooded sweatshirt soon followed. : Russell has never forgotten that its products are only as good as the people who make them. As they celebrate over 100 years in business Russell Athletic looks to the future with the same sense of excitement and purpose that has driven the company since 1902 from sweet home Alabama. 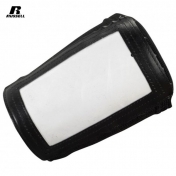 : Throughout its history, Russell has been involved in the manufacturing and selling of equipment for many professional, collegiate and high school sports teams. Most notably of these are uniforms for the Major League Baseball, and for selected high school and college baseball and football teams. Also POP Warner selected Russell as their official supplier of team uniforms.